The last year and a half of our lives has brought change on many fronts – our relocation, members of the family gained and lost, changes to our employment and income level, and the continuation of a change we had already begun with respect to the way we cook and eat. We still love our meat, but the kind of meat that we buy doesn’t come cheap, so we’re buying less of it, stretching what we do buy, and planning more meatless meals. Mike said to me that if I had told him a year ago he’d be eating, and feeling satisfied by, a nearly vegan meal like the one we had last night, he wouldn’t have believed it, but there we were, sitting at our table with empty bowls in front of us and bellies full of wedges of one perfect summer tomato, a tiny bit of cheese, and a truly delicious, totally meat-free soup. I had spotted the recipe in the current issue of Food and Wine, a chilled puree of zucchini and aromatics topped with lemony purslane, and Mike offered to take it on for Monday night’s dinner. He prepared the soup according to the recipe and left it in the fridge to chill, and when I got home I tasted and tweaked it just a bit, adding a bit more salt and a splash of Champagne vinegar to brighten the flavor. The soup was light and creamy and surprisingly filling, a refreshing dish for a steamy night, and I suspect it would be even better with a swirl of yogurt or creme fraiche added – though it would no longer qualify as a vegan dish. Regardless, this is just the kind of recipe that makes it very easy to eat your vegetables. but how does this satisfy mike now if it wouldn’t have before? i’m curious how to get guys to make this change – this is exactly an example of the kind of meal i can’t make for my boyfriend because it doesn’t fill him up and he’ll want to eat again later. You know, it has taken a while, but I think the trick is to do it gradually. We started by doing one meatless dinner a week, then buying one steak or chop instead of two and splitting it, that sort of thing. Mike comes from a family of big eaters who have the sort of big health problems that go along with overeating, and I think he was motivated to make some changes in his habits to avoid going down the same path. And it’s important to remember that you can have that steak or chop once in a while, just not every day. Hey everyone, thanks for asking. It’s been a long road. Like Jen said, I grew up in a world of heavy eaters. Put out a platter of pork chops and five minutes later, everyone’s back for seconds. If you wanted seconds before someone else grabbed thirds, you had to eat fast. No surprise that everyone on that side of my family is either fat or obese. My uncles are particularly imposing; 6’5″ is the shortest of them, and 400 pounds is the lightest of them. I may never go that route, but I can’t take that chance. Not only are my uncles all very large, they all also have adult-onset diabetes. And none of them were diagnosed until after they became obese. I’m fighting my genes now. It’s one reason I go out several days a week (when it’s not 90-degrees-and-up out) on my bike. It’s also a reason some of my bike rides are 20 and 30 and 40 milers. We’ve been working with veggie-heavy meals for a couple of years now, especially in the summer when everything’s so fresh and good. I don’t remember when Jen started Meatless Monday, but it’s something I keep encouraging her about, especially in the darkest, coldest part of winter when she’s braising hardy greens again. 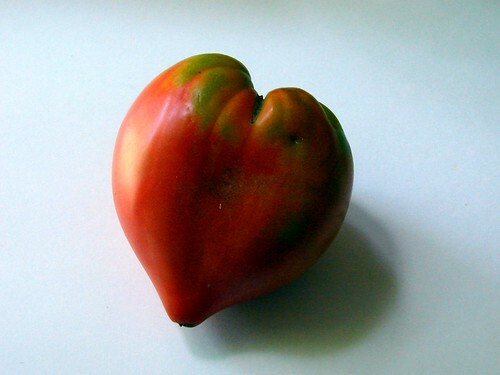 Going vegan for a meal or two isn’t a big stretch beyond meatless, frankly. When the food’s as good as what Jen normally puts on the table, it’s not a hardship at all. Think, too, about how many classic dishes are already vegetarian. Just to name one, the traditional Napoletana pizza of tomatoes, mozzarella, and basil. That’s so delicious when it’s made well that I’d be foolish to think of it as a depravation just because there’s no pepperoni on it! Ooh, awesome. I cut out that recipe, too. 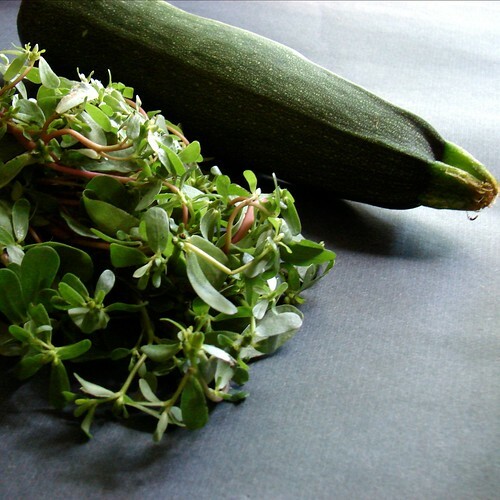 Always looking for things to do with purslane, since it’s cheap and healthy! My husband has always complained about meatless meals…….we used to have chicken/fish/meat/pork almost every night for dinner. Not only is it expensive, but not healthy to eat so much animal protein. I have SLOWLY changed the menus to farmers’ market produce dinners, pastas, salads, cheeses, etc. and after 20 years of cooking, he finally looks forward to a meatless meal! It took some time, but eggplant parmesan, panzanella salads, pasta with homemade pesto, etc. is now being requested here! My husband’s family is much the same way…a meal isn’t a meal without meat. But fortunately, Jason has really become thoughtful about food and what we’re eating, and he is happy to have a few veggie meals during the week. I agree, though, it’s all about the slow change…increasing the meatless meals by one a week, or every few weeks, until you’re doing 50/50, or even 25 meat/75 veg. I agree, you’re not preaching, it’s just a nice reflection on thoughtful eaters. Since moving to a part of RI where we are surrounded by farms, with room for our own garden, it’s been much easier to incorporate more meatless meals into our repertoire. My husband loves harvesting herbs for our cooking, and with two sources of farm-fresh goat cheese within half a mile of us, as well as farm-fresh eggs and veggies, we can eat meals like this all summer. In the winter, we do retrench to more meat and heavier foods, but for the precious few months a year when the farms are producing, there’s nothing like it. I adore your collaborative approach to this recipe. As we work opposite schedules, this scenario of each working on the dish throughout the day is familiar. 😉 Now, I need to get home to break out this issue of F&W. The purslane cracks me up — it drives my mom NUTS in her garden because every time it rains there are seven million new purslane plants. HA! 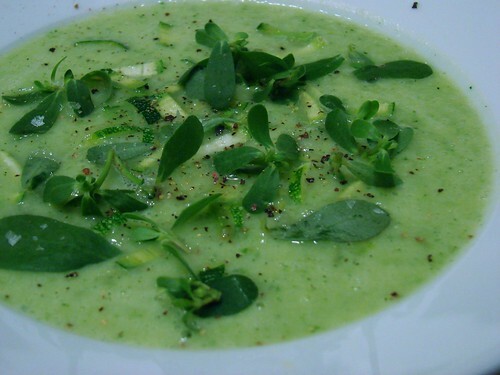 what a gorgeous green soup…and maybe a good way to use up the surfeit of zucchini that’s available now! What a treat to find your blog. I have been incorporating these changes as well with my husband and three children. In the beginning it was hard just getting them to hold my bags at the farmers market. Now my kids are fighting for the last of the salad and turning up their noses at factory farmed eggs. 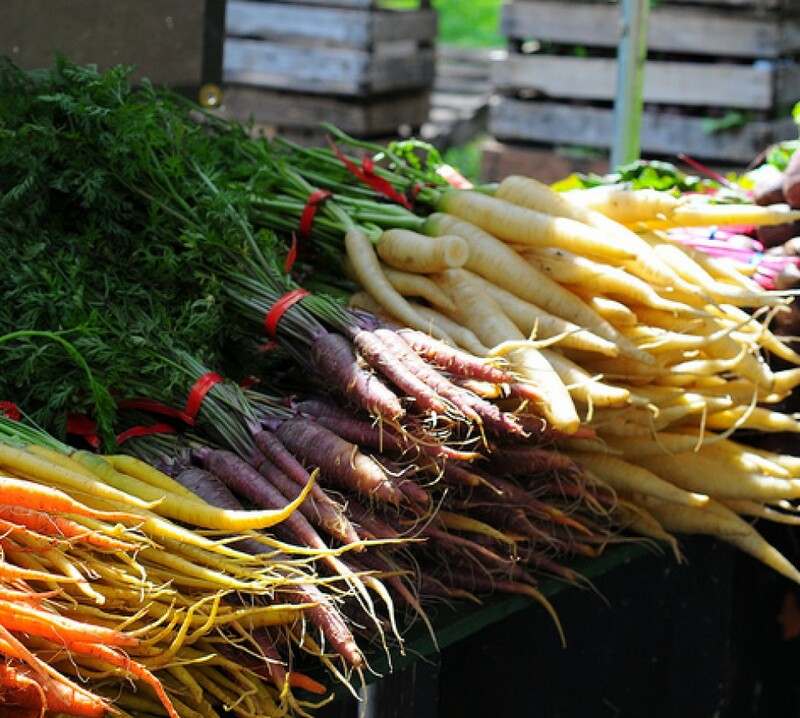 We are local to Coastal Growers Market at Casey Farm and feel privileged that 80% of everything we eat comes from there. Stacey – Yeah, the cost of meats and poultry is definitely a factor for us, too. Glad to hear that your husband has come around! Jennifer – I am very lucky to have a husband who enjoys being in the kitchen as much as I do! Laura Grace – I swear I am seeing it EVERYWHERE now! quiltcat – Everybody needs more zucchini recipes this time of year, right? E Collins – That’s wonderful that they’re enjoying and embracing the change! And how lucky you are to be so close to Casey Farm. We made one trip out there in the springtime, and it was a sight to behold. They’re doing great things there, and we’re huge fans.